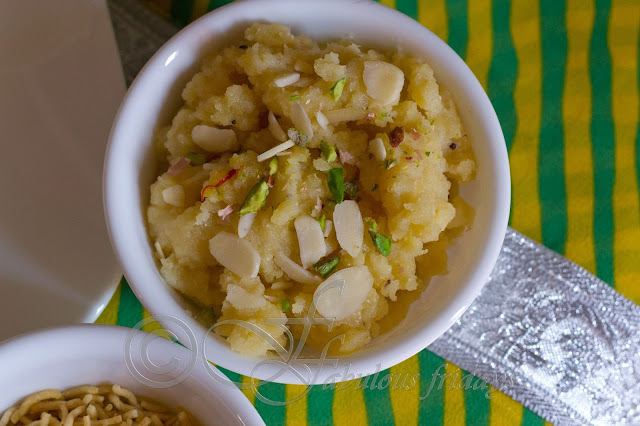 Moong dal halwa is a traditional sweet dish popular in Rajasthan. It is made during the festive season (Diwali, etc) and for weddings. This calorie dense dish requires a lot of preparation time including patience to roast dal on low heat, but the result is well worth the effort. When making this dish, do not skimp on the ghee. It is required for proper roasting and for the correct texture of the halwa. Soak moong dal for 4 hours. Drain and grind it coarsely using very little water. Make sure there is less water otherwise the dish will not turn out as good. Mix water, milk and sugar together in a pan and bring to boil. Keep aside. Heat ghee in a pan and add the moong dal paste. Roast dal on a low flame stirring continuously till it becomes golden brown and imparts a cooked roasted aroma. This process requires a lot of patience. So take your time and roast it well. this is the most important part of this recipe. Add the warm sugar mixture to the roasted dal and stir continuously to avoid any lumps. Add cardamom powder and saffron mixture. Mix till all the moisture has been absorbed. Remove from flame and add the chopped nuts. Serve hot.